NowPublic now counts nearly 97,000 contributing reporters in more than 140 countries around the world. During Hurricane Katrina, NowPublic was there; eight contributors filed on-the-scene reports from London's Heathrow Airport during the August 2006 terrorism lockdownwhile the regular press was forced to wait outside. 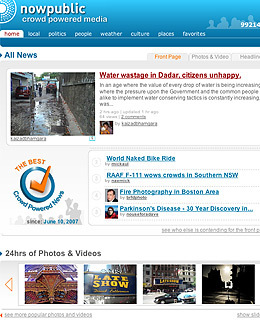 On June 6 NowPublic's coverage of a storm in Oman made it to the top of the AOL and Yahoo news sites. As part of its partnership with the Associated Press, NowPublic reporters now help the wire service gather footage on the ground. "We wanted to build a next-generation wire service that counted for the accidental bystanders, the storm chasers," co-founder Leonard Brody says. "And with digital capturing devices now in the average person's hand, they can be first when there's breaking news."